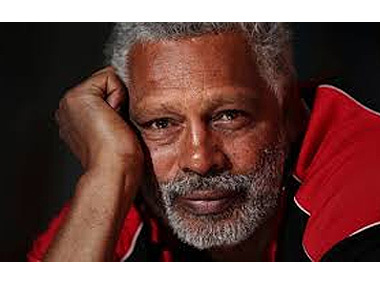 A contemplative Ernie Dingo thinks about the importance of language. I've just discovered a new TV series starting TONIGHT about Indigenous languages - such a key element in maintaining culture for Aboriginal people. You'll notice that a high proportion of participants are also artists. It's on the NITV channel (associated with SBS) at 8.30pm, and runs for 6 weeks on Sunday nights. Talking Language with Ernie Dingo is a personal journey providing a unique understanding of how knowledge of Aboriginal languages is shaped by ancestral connections to the land, stars, water, sea and the air we breathe. Ernie visits six people from across Australia whose stories of a spiritual connection to country highlight some of the benefits and current challenges people face to maintain, revive and create languages within their communities. Episode 1: Banduk Marika - Ernie visits an old friend, Banduk Marika, in Yirrkala in North East Arnhem Land. She is one of 6 -7000 people who speak one or more of the many Yolngu languages in the region. Banduk lived and worked outside her community for many years and is a well-known Yolngu visual artist, fluent in several languages. Banduk guides Ernie towards an understanding of the relationship between the ancestral knowledge found in the local environment and the importance the oral language has on the creation and maintenance of local histories, her art and ultimately Yolngu identity. Episode 2: Tom Trevorrow - Ernie travels to the Coorong in South Australia to meet Ngarrindjeri Elder, Tom Trevorrow. Ngarrindjeri is a revival language with more than 250 speakers. Tom traces the impact that missionary and colonial history, along with environmental changes in the Coorong’s ecosystem, has had on the survival of the Ngarrindjeri language and culture. A sudden turn in the story forces Ernie to reflect on the circle of creation that weaves new life. Finally, he understands the significance of the many generations that have fought to maintain and share the language and culture of Ngarrindjeri people and why it is important to continue the journey. Episode 3: Vicki Couzens - European colonisation had a devastating impact on the numerous language groups in the State of Victoria. In this third episode, Ernie travels to Melbourne to meet Vicki Couzens, a descendant of the Gunditjmara and Kirrae Whurrong clans, located in the western districts of Victoria. Vicki is dedicated to language revival and shows Ernie the importance that museums and archival material play in reinvigorating language, culture and the relationship to country for her community. Travelling to her country Vicki shows Ernie how bringing back the knowledge of language into the country and the community is the most important aspect of reviving language and the sacred traditions of her ancestors. Episode 4: Margaret Kemarre (MK) Turner - Ernie travels north east of Alice Springs to the Harts Range in the Northern Territory to meet MK Turner. Aunty Margaret is one of over 500 speakers of the Arrernte language, but is one of only a handful of people who speak what she calls ‘the Eastern Arrernte old language.’ MK’s son Raymond (Shorty) Webb shares a men’s dreaming story with Ernie at a local rock hole, while MK shows Ernie how to collect some bush medicine. In Alice Springs, MK and Ernie share some important tips on desert sign language. MK also teaches Arrernte and Non-Indigenous primary school children her language and believes that teaching young children is an important way to keep her language and culture growing for future generations. For Ernie, the opportunity to be with MK provides a rare opportunity to hear, see, feel and understand the language of her country. Episode 5: Pansey Cheedy - Ernie travels to the Roebourne community to meet Pansey Cheedy, one of over 300 Yinjibarndi speakers in the Pilbara region of Western Australia. Yinjibarndi is a living language and Pansey explains to Ernie the diversity of languages in her region and the strength and challenges that come from being the last generation of language speakers who know the depth of the old language and its tradition. Ernie visits the local radio station and archiving project to learn how language is maintained and preserved in Roebourne. According to Pansey Cheedy, the largest impact on the survival of language and culture in her country is from mining. Ernie realises the importance of keeping the language and law of the land safe for current and future generations of Yinjibarndi speakers. Episode 6: Bill Harney - In this final episode, Ernie travels 200km west of Katherine in the Northern Territory to visit Wardaman Elder, Bill Harney. 80 to 100 people speak and understand the Wardaman language - Bill is the last fully initiated Lawman of his country and is one of only 8 speakers who know the old language. Ernie explores the country of Bill’s birth and hears the stories of first contact, traditional language boundaries and the creation stories that connect the night sky with the law and language of the land. Bill reminds Ernie of a ‘proper bush gentleman’ and it is through his generosity and deep cultural awareness that Ernie finds a special place of understanding and knowledge.